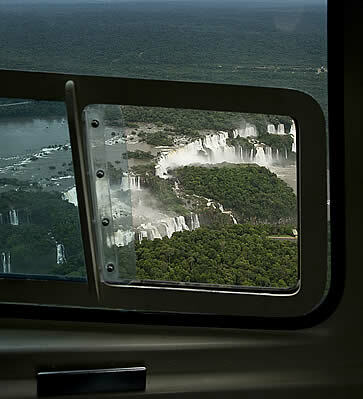 There are many ways to experience Iguassu Falls, but if you really want a deep understanding of this natural wonder, here�s the way to do it: by land, by water, by air. Bridget McNulty took the plunge. Iguassu Experiences could not be a more perfect name for the company that organizes tours around Iguassu Falls for guests of Hotel das Cataratas. �Tour� on the other hand, now there�s a word that could do with a makeover. When you hear the word tour, you probably picture queues of people lining up with matching t-shirts to gawk at something, take a few photos, and move on. Not so at Iguassu Falls. These are more like lessons in wonder. There�s a trail that runs through the Iguassu National Park (a UNESCO Natural Heritage Site), with paths that open up to reveal stunning panoramas of the falls, and jungle creeping in at every turn. You can walk the path with all the other tourists during the day, or you can take advantage of being a Hotel das Cataratas guest and walk it in the early morning, before the 9am park opening hours, or at the end of the day, once everyone has cleared out but before the sun sinks behind the falls. Better yet, you can do the walking tour of this Brazilian side of the Falls with Wilson Fernandes, resident biologist and one of the most fascinating people I met in Brazil. Wilson spent two years living with the Guarani people, who used to be indigenous to this area, and can tell you all about traditional uses of plants and herbs, as well as everything you want to know about the flora and fauna of the area (you�ll no doubt see the very cute cuati, relatives of the raccoon, some incredible birds, a couple of turkey vultures and a toucan, if you�re lucky). Wilson will also fill you in on the history of the falls, formed about 150 million years ago, and the science behind the rainbows, glimpsed at every turn. This is a land of rainbows, butterflies and waterfalls � as magical as that may sound � and having someone explain the intricacies of it makes for a far more meaningful experience. The Macuco Safari Tour is perhaps the most popular tour in the Iguassu National Park, and for good reason. The day begins with a three-kilometre ride in an electrical wagon, through the rainforest and with highlights of the surrounding vegetation pointed out to you by your guide. Then there�s a 600-metre walk along a raised walkway through the rainforest, stopping off at a small but lovely waterfall, surrounded by butterflies. And finally, there�s the main attraction: taking to the river. An inflatable twin-engine boat zooms off up the river, towards the Iguassu Falls, speeding along at an exhilarating pace and pausing for a photo opportunity right in front of the falls. No sooner has everyone packed away their cameras than the boat speeds right up to and underneath one set of waterfalls � either the Three Musketeers Falls or the Three Marias Falls, depending on the season. Yes, that�s right under a waterfall, make no mistake about it! The boat returns for a few more swoops under the falls, until everyone is totally soaked and shrieking with delight, and then it�s back down the river at the speed of light. A brief but wonderful glimpse of the waterfalls up close. Be prepared, though, that this is a hugely popular tour for everyone who visits the Iguassu National Park, so lines were fairly long and things got somewhat chaotic down near the water, with everyone eager to get on the boat as soon as possible! My advice? Don�t rush, enjoy the hundreds of butterflies concentrated in the area, and soak up the jungle. And this, really, is a case of saving the best for last. 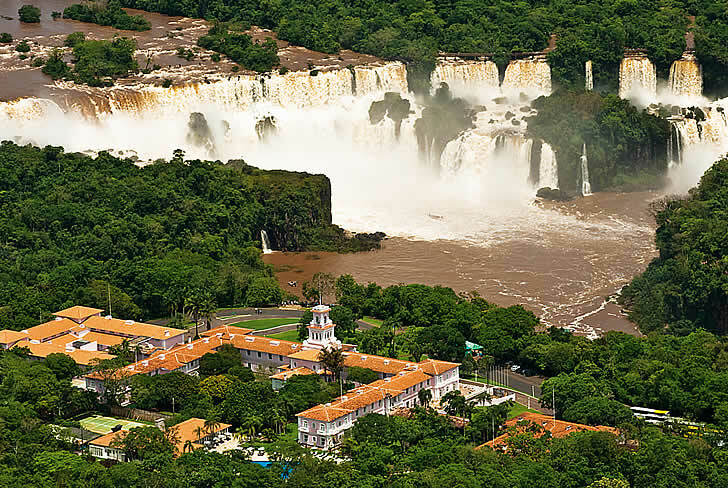 An absolutely breathtaking way to experience the magic of the Iguassu Falls. 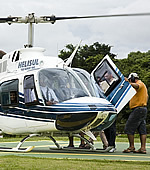 The ten-minute helicopter ride (that feels far longer) takes you over the Iguassu National Park, a rainforest stretching out as far as the eye can see; and right up to the falls, which appear, at first, as a cloud on the horizon, and slowly reveal themselves as a slice of river and an epic ring of waterfalls. The helicopter circles the falls a few times, in stomach-dropping loops that leave you breathless, and somehow the ten minutes stretches out in slow motion so that you feel as if you�re in the air for ages, paused above this awe-inspiring sight, able to take photographs or video as you wish. Simply unforgettable. So there you have it: three ways to see Iguassu Falls in a completely different way. Three ways to experience the jungle, the river, the falls. Three ways to ensure you will never forget this most wondrous of places. 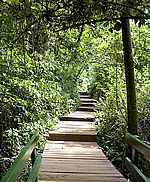 Poco Preto Trail: A four-hour trail through the forest and along the river, highlighting the animals, birds and flora of the Iguassu National Park. The Bird Park: More than 900 rare and colourful birds from 150 different species, most of them indigenous to the surrounding rainforest, live in this natural environment with trails and spacious walk-through aviaries. Itaipu Binational: A fascinating visit to this giant of a hydroelectric plant, able to produce 95 million kilowatts / hour per year. 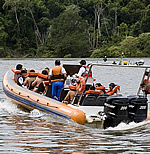 Rafting at Iguassu River: Ride down the Iguassu River for 40 minutes on an inflatable boat. The difficulty varies from a rating one (easy) to three (difficult), depending on the river level. Not for the faint-hearted! Canopy Tour: Zip through the trees on this canopy tour, designed for those who want to get up close and personal with the forest. Rappel: Fantastic views and high adventure guaranteed! Lower yourself on a rope down the 55-metre drop to the Iguassu River, as you take in the amazing views of the waterfall. 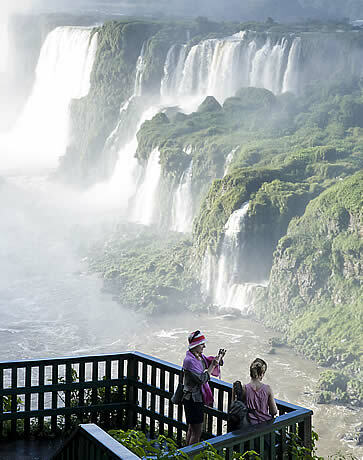 Argentine National Park: Spend a half-day exploring the Argentine side of the Falls, along one of three main walking circuits. A great opportunity to get close to the power of the waterfalls. EMAIL US if you�d like advice on what to choose or need help with planning your jungle adventure!